Learn more about Tucson, Arizona using the City Guide below. Plan a trip, find local shopping centers, or just discover what makes Tucson, Arizona so great! At an elevation of 2,400 feet, it has slightly cooler temperatures than its desert cousin, Phoenix. It is situated in the biologically diverse Sonoran Desert. With a population of 486,699 (2000 Census) in Tucson and 843,746 in the metro area, Tucson was the 32nd fastest growing of 280 metropolitan areas from 1990-2000. It wasn't until 1775 that the Presidio of Tucson was created by Don Hugo O'Conor. At that time, it was the northernmost Spanish outpost in the New World. In 1821, Tucson became part of the new country of Mexico, and in 1853 it became part of the United States as a result of the Gadsden Purchase. In 1863, Arizona became a US territory, and by 1880, its population was around 8,000. In 1912, Arizona became the 48th state to enter the union. Tucson International Airport, 7250 S. Tucson Blvd., Tel. (520) 573-8000. Amtrak Station: 400 N. Toole Ave., Tel. (520) 623-4442. I-10 from the north and southeast, and I-19 from the south. Greyhound Lines, Station: 471 W. Congress St., Tel. (520) 792-3475. By Car. I-10 and I-19 are the only freeways in Tucson. East-west travel on surface streets above I-10 can be slow during the work day. By Bike. Tucson is a bike-friendly community, and has an extensive system of bike routes and paths. Sabino Canyon, Spectacular desert canyon cut into the south side of the Santa Catalina Mountains, now on Tucson's northern urban fringe. Arizona-Sonora Desert Museum, 2021 N. Kinney Rd., Tel. (520) 883-2702, More like Biosphere II than a walled institution, the Arizona-Sonora Desert Museum is part zoo, part natural history museum and part botanical garden all in one Tucson attraction. From tarantulas to black bears, coyotes to scorpions, the museum-zoo is an entrancing and full-contact tribute to the Sonoran desert's wildlife (the wire fences are nearly invisible and the hummingbirds in the buzzing, walk-in aviary seem to think you are the attraction). Give yourself time to soak in the Southwest splendor and if time is all you have, the Museum is also on the fringes of Saguaro National Park, home to the world's largest forests of Saguaro cacti. Saguaro National Park, 3693 South Old Spanish Trail, Tel. (520) 733-5153, The most dense forest of the iconic cactus of the American West. The park has two unconnected units to the east and west of Tucson. Tohono Chul Park, 7366 N. Paseo del Norte, Tel. (520) 742-6455, "Tohono chul" means "desert corner" in the Tohono O'Odham's (desert people's) language, and this haven in the midst of Tucson's burgeoning north side offers a tea room, gift shop, book store, and art gallery in the middle of trails and gardens. There are extensive botanical exhibits explaining the native plants, and a wonderful plant-sale area in which to buy them for your own garden. Many kinds of desert birds are frequent visitors. Mission San Xavier del Bac, 1950 W. San Xavier Rd., Tel. (520) 294-2624, The "White Dove of the Desert" is a Tucson mission. Pure white and pristine against a hot desert backdrop, and still heady inside its elaborately colored and muraled interior from centuries of supplication, the Mission San Xavier del Bac was finished in 1797 when Arizona was still New Spain. It has recently been cleaned and restored by professional art conservators who worked with and trained members of the community. Old Tucson Studios, 201 S. Kinney Rd., Tel. (520) 883-0100, Ever notice that Hollywood's Old West, the backdrop for the gun-slinging and cryptic comments of Hollywood's Western icons -- Wayne, Eastwood, Douglas and Newman -- has much in common with the Wild West of today's Tombstone and Geronimo? They've all been filmed at the Old Tucson Studios, originally built in 1939 for the making of the William Holden vehicle "Arizona." Still an active film, TV and commercial set, it's also a nostalgia-themed park, with main drag shootouts, corseted can-can dancers, educational shows, pre-Prohibition saloons, restaurants and gift shops. El Tiradito (The Castaway), South Granada Avenue at West Cushing Street. El Tiradito is the only shrine to a sinner in North America. In the 1880s, a young man had an affair with his mother-in-law. When caught in the act, his father-in-law shot him and he stumbled from bed and ran out of the house. He dropped dead on this spot, and because he had not confessed his sins, he could not be buried in the church yard. His family and friends interred him where he fell, but remembered him with candles and flowers. People still burn candles and leave offerings today. The shrine is located in what remains of Tucson's barrio (much of which was destroyed when the Tucson Convention Center was built). Best visited at dusk or after dark. Center for Creative Photography, is located on the University of Arizona campus, and routinely features works of famous (and not-so-famous) photographers. When they have their Ansel Adams collection up it is a must see. Kitt Peak National Observatory, is one hour southwest of Tucson. A "don't miss" for the astronomy buff, there are several astronomical telescopes plus a large solar telescope. There are tours available. Fred Lawrence Whipple Observatory, is one hour due south of Tucson off I-19 near the town of Amado. Call ahead for tour information. Pima Air & Space Museum, 6000 E. Valencia Rd., Tel. (520) 574-0462, Features over 250 historic aircraft. Titan Missile Museum, 1580 W. Duval Mine Rd., Sahuarita, Tel. (520) 625-7736, Site south of Tucson preserves a Cold-War-era underground silo housing an unarmed Titan-II ICBM. Part of a larger field of such silos, this was one of the places from which nuclear war on the Soviet Union would have been waged. Tucson Botanical Gardens, 2150 North Alvernon Way, Tel. (520) 326-9686, This beautiful oasis in the heart of Tucson was originally the home of Bernice and Rutger Porter. Dating to the 1920s, the earliest buildings on the property were constructed of adobe bricks made right on site. True to the vision of Mrs. Porter, Tucson Botanical Gardens is a place of beauty, inspiration and education about the natural world. Kartchner Caverns State Park, Nine miles south of I-10, off State Hwy 90, exit 302, Benson, Tel. (520) 586-CAVE, Kartchner Caverns State Park, opened in 1999, is one of Arizona's newest wonders. Kartchner Caverns is a stunning limestone cave system considered one of the top ten in the world. Discovered in 1974 by explorers Randy Tufts and Gary Tenen, and not revealed until 1988, the opportunity existed to preserve the caverns in near pristine condition. Club Congress. 311 E. Congress St., Tel. (520) 622-8848. If you feel like dancing, Club Congress is the place to go. Located in the historic Congress Hotel, you'll find three bars and one dance floor, featuring techno dance beats and live bands. Call ahead to see who's playing. Cover charge. Plush, Live music - talented local, regional, and national touring acts 5-7 nights a week. 4th Avenue One of two locations with a large concentration of bars and nightclubs, most notably Maloney's (a Pub chain), O'Malley's (Sports bar/dance/live music), The Shanty (Pub), Bison Witches (Sandwich shop/bar), North on 4th (bar/pool hall), and The Surly Wench (bar/live music). The Summit Hut. 5045 E. Speedway at Rosemont, Tel. (520) 325-1554 and 605 E. Wetmore at 1st Avenue, Tel. (520) 888-1000, Offers great gear and resources for getting outdoors around Tucson. A very local shop with more than 30 years of experience. Go in and ask questions, these guys will take the time to help you out. "Silver Sea" 137 E. Congress St. (520)624-9954 Offers sterling silver jewelry at competetive prices Interesting little figurines (fantasy, gothic, egyptian, skulls) and a variety of giftie-type things. Silver Sea has been in business since 1993 and moved downtown in 2003. Silver Sea is owner operated-Lizzie will help you find the perfect goodie to bring back with you. "Lizzie Stardust" label jewelry available in limited supply lots of OOAK items! As you can guess, Tucson is a veritable hub of Southwestern and Mexican cuisine. But Tucson is an adventurous town (easily the most liberal metropolitan area in Arizona) and as a result of it's diversity, has a vibrant culinary culture. Epic Cafe. 4th Avenue at University. An eclectic coffee house with outdoor tables, free WiFi, good organic food, intricately tattooed waitstaff, and an independent vibe. Bulletin boards to see what is going on in town. Coffee $1-$3; soups, pastries, and sandwiches $3-$8. Pat's Chili Dogs. Mission Road between St. Mary's Road and Speedway. An old time "drive in" (carhop service however does not exist - you must walk up to the order window). Lunchtime is packed with Tucsonans ordering the most famous Chili and Cheese Dogs in the State (I drive from Phoenix occasionally just to eat them!). French fries made from fresh potatoes on site. Lots of hot sauce. Arriba!! Birreria Guadalajara. Southeast corner of 22nd. Street and 4th. Avenue. A hole in the wall Mexican diner frequented by the Hispanic workers and Gringos "in the know". All the standard Mexican fare, but an unusual emphasis on "caldos" or soup. Birria is shreaded beef in it's own broth. This place makes the best! Yoshimatsu Healthy Japanese Food. 2745 N Campbell Avenue, Tel. (520) 320-1574 Local, home-made Japanese food. Recently opened a sushi bar within the same building. Great first date location and a separate vegetarian menu. Beyond Bread. 3026 N. Campbell Ave., Tel. (520) 322-9965, Amazing sandwiches on fresh-baked bread, made from ingredients that are as fresh as possible. (In addition to baking bread daily, the restaurant also roasts its turkey and beef on site.) They also have an espresso bar and pastries. A nice place for lunch, but watch out -- it's very popular, and you may have to wait in line. Average sandwich (hot & cold) costs around $6-6.50, chips included. Buddy's Grill, 4821 East Grant Road, Tel. (520) 795-2226. Buddy's Grill dishes up American meals dominated by seafood and steaks. Expect the average entrée to cost roughly $8 to $12. Home Town Buffet, 5101 North Oracle Road, Tel. (520) 888-1060. You'll find that Home Town Buffet focuses on American food. Expect the average entrée to cost in the range of $8 to $12. eegee's, A favorite sub shop of the locals, noted for its flavored ices. There are several locations, but the chain is exclusive to the Tucson area. Char Thai. 5039 E 5th St, Tel. (520) 795-1715. It's not always easy to find good Asian restaurants in the desert, but this hole in the wall has to be near the top of anyone's list of favorites. Owned and operated by former residents of Bangkok, the restaurant has a huge selection of tasty curries and noodle dishes. The lunch specials are a great value. Viva Burrito Co. A local fast food chain known for its large, tasty breakfast burritos at a cheap price ($2.10). Open 24hrs. El Güero Canelo. 5201 S. 12th Ave. 12th Ave. south of Irvington. Tasty food, especially their hot dogs wrapped in bacon. Cup Cafe, 311 E. Congress St., Tel. (520) 798-1618, Unusual, eclectic mix of Indian, Thai, Japanese, American and Mediterranean food, easily the most interesting restaurant in Tucson. You'll find plenty of vegetarian and some vegan options. On a nice day you can sit outside. El Charro Café, 311 N. Court Av., Tel. (520) 622-1922, Opened in 1922, El Charro is the oldest continuously-operated, family-owned Mexican restaurant in the United States. The food is classic Southwestern, with more Sonoran influences than many Tucson restaurants. El Minuto Cafe, 354 S. Main Av., Tel. (520) 882-4145. Authentic Sonoran cuisine in an adobe house in the barrio, open since 1936. You really can't go wrong with anything on the menu, but do order the mole if they have it on the day you are there. The carne seca is superb and the chiles rellenos are magnificent. Make sure to sample the fresh, made-on-the-premises tortillas. Combine this with a visit to El Tiradito, which is nearby. Rosa's Mexican Food, Ft. Lowell Rd. at Campbell Avenue. Excellent Sonoran-style Mexican food in this family-owned and operated storefront restaurant. Rosa's salsa is consistently voted one of the top three in Tucson by the readers of the Tucson Weekly. The food is heavy on the meat and cheese, with buttery tortillas and delicious refried beans. The average entree is $7-$10. Black Angus Restaurant, 5075 North Oracle Road, Tel. (520) 293-7131. If you try out Black Angus, you'll find a steakhouse that serves patrons American dishes where people frequently get steaks. Expect the average entrée to cost roughly $12 to $20, and go dressed casual. Café Terra Cotta, 4310 North Campbell Avenue, Tel. (520) 577-8100. Su-Th 11AM-9PM; F,S 11AM-12AM. Café Terra Cotta focuses on preparing southwestern American cooking. Expect the average entrée to cost in the range of $12 to $20, and plan to fit the scene by dressing casual. Roma Caffe, 4140 West Ina Road, Tel. (520) 744-2929. This place focuses on an Italian cuisine. Expect the average entrée to cost from $12 to $20, and dress casual. Takamatsu, 5532 East Speedway Boulevard, Tel. (520) 512-0800. Takamatsu concentrates on Japanese and Korean dishes where it's common to order sushi. Expect the average entrée to cost between $12 and $20. Also, you'll notice that there is habachi-style cooking. Vivace Restaurant, 4811 East Grant Road, Tel. (520) 795-7221. Vivace is an upscale restaurant that focuses on and serves Italian dishes. Expect the average entrée to cost $12 to $20, and dress casual, but fashionable. The atmosphere is enhanced by flowers at the tables. The establishment is spacious. Table talk requires you to speak up a bit here. Also, you'll notice that there is an open kitchen. Yamato, 857 E. Grant Rd. Sushi and Japanese. North, 2995 E. Skyline Dr. Located in the La Encantada mall. Italian in heritage, but extremely experimental. Dishes range from pizzas to pasta to steak, and are normally in the range of $19-$25 (others depend on market prices). Sushi Ten, 4500 E. Speedway Blvd. Japanese, sushi. El Mezon del Cobre, 2960 N 1st Ave. A lesser known but not unknown, great Mexican restaurant. Hacienda del Sol. 5601 N. Hacienda del Sol Rd., Tel. (520) 529-3500, Mobil four-star American-style grill featuring (Fall 2004) swordfish, Angus beef, buffalo sirloin, lamb, Scottish salmon, and other entrees. Reservations recommended. Angelo's, 4405 West Speedway Boulevard, Tel. (520) 624-8946. Focusing on Italian, Greek and European cuisines, this is an upscale restaurant. Expect the average entrée to cost between $20 and $30. The restaurant has a contemporary European style décor. The restaurant has a romantic atmosphere -- a favorite among couples. Arizona Inn, 2200 East Elm Street, Tel. (520) 325-1541. Serving an American fare, this is a fine dining facility. Expect the average entrée to cost in the range of $20 to $30. Architectually, the restaurant is in an historic structure. The restaurant has a southwestern U.S. style décor. The interior is enhanced by prints and flowers at the tables, and the lighting is set quite dim. This is a white tableclothe restaurant, and the fireplace adds to the atmosphere and mood here. The establishment has several dining rooms. It has a romantic atmosphere. Barrio Food & Drink. 135 S. 6th Ave., Tucson, AZ; Tel. (520) 629-0191. One of the best bars in Tucson, with fully-stocked offerings, and knowledgeable, friendly staff. The decor is quintessentially Southwestern, and is both casual and elegant. Bison Witches. 326 N. 4th Ave., Tucson, AZ; Tel. (520) 740-1541. Located at the heart of Tucson's 4th Avenue historic district, Bison Witches is a funky little bar that serves amazing sandwiches and the best margaritas in town. The Surley Wench 424 N 4th Ave Tucson. Serves a lot of Rolling Rock. Congress Hotel, 311 E. Congress St., Tel. (520) 622-8848, This historic hotel was the site of John Dillinger's arrest. The rooms are small, but have a funky, historic feel. In addition to regular rooms, you'll find a youth hostel -- but beware, the hostel rooms are over the dance floor. Roadrunner Hostel & Inn, 346 East 12th Street, +1 520 628-4709, cell +1 520 940-7280, Beds are $20 per night. Private rooms are $38 per night. AmeriSuites Tucson/Airport, 6885 S. Tucson Blvd., Tel. (520) 295-0405, Located 0.5 miles south of the Tucson International Airport and minutes from the Desert Diamond Casino. Desert Dove Bed and Breakfast, 11707 E. Old Spanish Trail, Tel (877) 722-6879, We invite you to the Old West where here at Desert Dove a Tucson Arizona Bed and Breakfast you can relax, enjoy and reminisce. Our territorial adobe bed and breakfast is situated on four acres and nestled in the foothills of the Rincon Mountains near the Saguaro National Park East. Lodge on the Desert, 306 N. Alvernon Way, Tel. (800) 456-5634, Founded in 1936 as a dude ranch on the edge of town, Lodge on the Desert is now in the heart of the city. However, it still exudes desert style and beauty. The 35 rooms are beautifully appointed with unique Southwestern flair. Starr Pass Golf Suites, 3645 West Starr Pass Blvd +1520-670-0500, 80 spacious casitas and suites with spectacular desert views, many with fireplaces and balconies. Westward Look Resort, 245 E Ina Rd., Tel. (800) 722-2500, A full service resort and spa located on an 80-acre oasis. There is onsite horseback riding, hiking, birding, swimming, and gourmet dining. Tucson Marriott University Park, 880 E Second Street, 520-792-4100, Just steps from the front door is Tucson's most vibrant social and cultural neighborhood. The Arizona Inn, 2200 E. Elm St., Tel. (520) 325-1541, This charming and classic 1930 resort was built by Isabella Greenway, Arizona's first woman to serve in the U.S. Congress (1933-1937). Colorful stucco casitas and suites ramble through meticulously groomed grounds. The Arizona Inn has won top awards from Zagat and Condé Nast, and is listed on the National Register of Historic Places. The Loews Vantana Canyon Resort, 7000 North Resort Drive, Tele (520)-299-2020, This hotel is located at the foot of the Santa Catalina Mountains. There are a total of 398 guest rooms on three floors. There are two pools, five restaurants, a spa, running path, hiking trails, and there are many species of birds right outside your room on the side that looks out to the mountains. In Janurary, 2006, Conde Nast Traveler ranked Loews Ventana Canyon Resort as one of the top 25 resorts in North America. There are also two 18 hole golf courses around the hotel. there is free access to Sabino Canyon via a van. Tanque Verde Ranch, 14301 E Speedway, Tel: (520)296-6275, Guests staying at the Tanque Verde Ranch have a choice of being pampered by daily massages or hitting the trail by horse or foot. Located on 640 beautiful acres in the foothills of the Rincon mountains east of Tucson Arizona, the Tanque Verde Ranch offers Arizona horseback riding, tennis, guided hiking, mountain biking, nature walks and much more, all included in your nightly rate. This Arizona dude ranch, founded in 1868 in the verdant Sonoran desert, offers an excellent Southwestern resort along with a historic Arizona dude ranch experience in a secluded natural setting. Listbb.com When it comes to Southern Arizona, it's never a matter of if you should stay but where you should stay.A List of Bed & Breakfasts, Tucson & Southern Arizona, will provide the perfect Bed & Breakfast for you. In this web site you will find Bed and Breakfasts in the heart of Tucson, in the foothills of the surrounding desert or in other Southern Arizona towns. Use the amenities search to find a Bed & Breakfast that meets your exact needs. Tucson Mountain Park, Gilbert Ray Campground, 8451 W Mccain Loop, Tucson, 85735 Secluded, quiet RV Park. 30 amp electric only, water and dump station available on the grounds. No reservations taken, honor system payments. No Showers. NOTE: Rattle Snakes are common in the campground. $20/ night for Rv's, less for tents. If you go walking in the desert parks, or on your own, learn desert safety tips. Take water, always let someone know where you are going and when you expect to get back, and if you have a cell phone, take it with you and have it on. It's disturbingly easy to get lost in the desert. Also, watch for snakes and bugs, as a few are dangerous to your health. When hiking, for example, rattlesnakes are easy to come across. When putting your slippers on in the morning, scorpions can be an unpleasant surprise. Crime is an issue in the city (as it is in all urban settings). Midtown, the South section of the city is not the safest place to be - but there are no real attractions there anyway. Downtown is heavily occupied until 2AM when the bars close. If you are downtown after 2AM, be cautious. While murder rates are fairly low,they are violent and sometimes random. There is gang activity but for the most part it is directed against rival gangs. There are many homeless people downtown. The center city is populated heavily by the "young and restless", so it may seem a spooky to more conservative travelers due to the dirt and noise the youngsters create. If you're a traveler, and you're leaving Tucson, you might want to go to Phoenix, or Nogales, Mexico. For cool weather, head up to I-17 to Flagstaff. Also take the Catalina Highway to nearby Mount Lemmon. Bisbee. For a pleasant day trip try Bisbee. The Copper Queen has great food and historic accommodation. Tombstone. Visit the clssic old west ghost town to see haunted theatres, graves of famous outlaws, and especially reenactments of the famous O.K. Corral shootout. This place is a must for any trip to Arizona. Travelling to or from Tucson, Arizona? 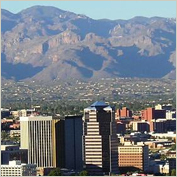 Find flight to or from Tucson, Arizona with an Online Travel Agency. Get lodging information or make reservations with a Local Online Hotel. Plan ahead and reserve a car with a Local Car Rental Agency. Are you relocating to Tucson, Arizona? Goods & Services in Tucson, Arizona.